A new scam is frolicking about Facebook, this time inviting users to view a video that will supposedly instill hatred for popular pop artist, Rihanna.There are already a few variations of the spam message with different URLs being advertised, but you’ll know the scam when you see it. Please beware that this is a fake message that is being spread across the social network. When users click on the scam link, they are taken to a fake page, which appears like Facebook and contains a video player. Clicking on the play button will not load the video, but will ask you to share the video link with your friends on Facebook. Sometimes it may result in downloading malware programs or other malicious files, which could possibly harm your computer. These files are programmed in a way to steal your personal and confidential information without your knowledge. We also recommend Vipre Anti-Virus to keep you safe from this kind of threat and can be found here. Amazon seems to be the company for internet scammers, who have now launched a new survey scam using the online retailer’s name. The scam offers a “free” Amazon.com gift card to anyone that’s willing to share the scam with their peers and post a comment on the page to help the scammer build credibility for the offer. Of course, scammers are never satisfied with a measly share & comment! Once you’ve completed step 1 and 2 on the initial landing page, you’re redirected to another website that starts off slow by asking for your zip code. The cybercriminals behind this scam don’t benefit profit from their little setup until you complete 13 “reward offers” and convince three friends to repeat your mistakes. Remove the link from your Facebook wall by clicking the ‘x’ in the top right corner. Remove the history of your comment on the scam page from your Facebook wall. Warn your Facebook friends & family not to share this scam or complete any of the “reward offers” associated with it. Let them know that it’s a scam and recommend that they follow the steps outlined above. In addition to this new Facebook survey scam, cybercriminals are also using Amazon’s brand in numerous spam campaigns that contain malicious file attachments, attempt to steal financial information, or link the recipients to dangerous websites that deliver malware. 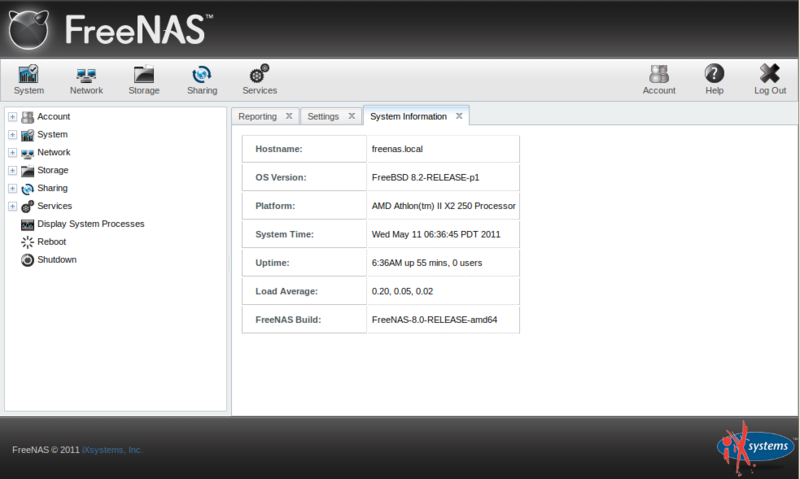 FreeNAS is a popular FreeBSD-based operating system for network-attached storage (NAS). Thanks to the easy-to-use web interface, you don’t have to know anything about the FreeBSD base under the hood to share your files. FreeNAS supports sharing your files using FTP, NFS, CIFS (Samba), AFP, rsync, iSCSI, and so on, and it also offers software RAID (0,1,5). With many advanced features, including Oracle’s ZFS file system, it’s the perfect companion to store files for your Linux, MAC OS or Windows desktop computers in one central place. FreeNAS has very low system requirements, as it needs only 128 MB of RAM. This makes it attractive to blow the dust off an old Pentium 2 or 3 PC, put a couple of hard drives in it and make it a NAS. Of course, for high performance the machine still needs enough RAM and CPU horsepower, especially if you want to use ZFS, which needs a minimum of 4 GB RAM to offer some decent performance. We will continue to use our FreeNAS sever in our office enviroment. The FreeNAS installer is bare-bones, but it gets the job done. 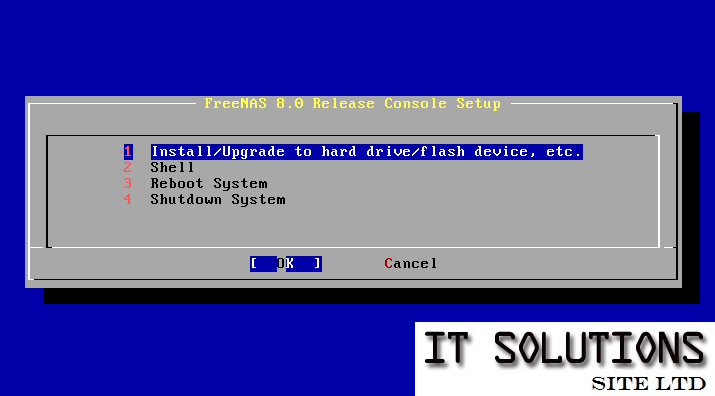 Essentially, you only have to select the medium where FreeNAS will be installed. Note that FreeNAS needs a full disk for its own, so you can’t store any data on this disk. Therefore, it’s recommended to use a small disk (such as a USB stick or a CompactFlash device) for the operating system and add bigger disks to store your data. Installation is extremely quick, and after FreeNAS has booted for the first time, it shows you a simple menu in the console to set up your network configuration if this hasn’t already happened automatically. If the machine has been assigned an IP address (as you’re probably using DHCP on your home network), it also shows you the URL to access the web interface. 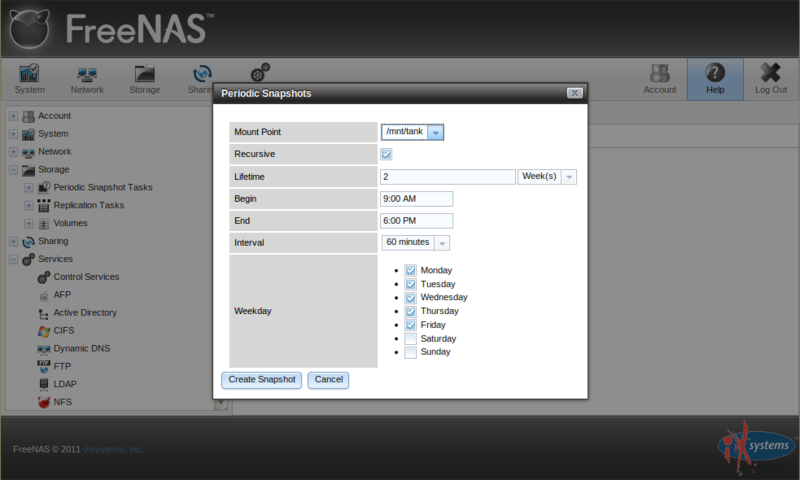 Log in into this web interface with the username admin and the password freenas. The web interface gives access to a whole load of information and settings. By default, you’re seeing tabs for system information, settings and some usage graphs. By clicking on the icons at the top or on the left, other tabs will be opened. The configuration settings give access to some really advanced features. For instance, the network settings even allow VLANs and link aggregation, and the iSCSI part in the settings is extremely comprehensive, allowing FreeNAS to act like a storage area network (SAN). All this can be done with a few clicks. The central part of the FreeNAS configuration can be found in the Storage tab. The focus is on ZFS features, but you can still create UFS volumes if you don’t need the advanced features of ZFS or if your hardware is underpowered. If you select more than one disk when creating a new volume, FreeNAS automatically asks you if you want to group them as a mirror or a stripe. After this, you can replicate your ZFS datasets to a remote system, you can manually create snapshots of your data, and you can even schedule automatic periodic snapshot tasks, so you can always restore a previous version of a file. FreeNAS 8 is a complete re-write of FreeNAS: the previous release was 0.7, which was based on FreeBSD 7.2 but had an architecture that was not flexible and modular enough to add new features. When the core developer announced that this led him to abandoning FreeNAS, the company iXsystems stepped in and announced it would take on FreeNAS development and give it the long-awaited re-write. This finally makes FreeNAS 8 a future-proof NAS operating system, based on FreeBSD 8. However, in the short-term this has some disadvantages, and you can see this clearly in this release: some functionality that was present in the previous FreeNAS release, such as iTunes/DAAP, BitTorrent and UPnP, has been taken out, and they will later be added as plug-ins in the FreeNAS 8.1 release. Also, it’s currently not possible to upgrade a FreeNAS 0.7 installation to the latest release, but the 8.1 release will get a migration utility that imports configuration settings and data volumes. iXsystems has turned FreeNAS 8 into a modern, modular and future-proof NAS operating system. The new web interface is really easy-to-use without hiding the advanced features. Unfortunately some features didn’t make it through the re-write, but they are promised to reappear in FreeNAS 8.1. All in all, this makes FreeNAS currently the most advanced NAS operating system. There has been a marked rise in computer users reporting cold calling scams relating to tech support. Most of the calls say they are from windows support or technical support and that your computer has a virus, any call telling you there is a virus, unless it is from an IT support company you have had dealings with, is potentially a scam. A lot of the calls originate from India but often they will try to convince you they are a UK company, often located in Birmingham, London, Manchester or Banbury. Advice to consumers is to either hang up, record the call to be passed on to fraud agencies or demand to be removed from their database and discontinue the call. At no point should consumers enter into discussion with these scammers or give out any personal details or computer IP addresses nor follow there direction to any website or remote access tools. 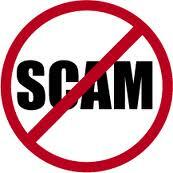 The scam works by telling consumers they have had a report from your computer that it has a virus and would like them to check for a list of files to confirm this, the list that comes up may well look convincing but really they are usually windows prefetch or temp files The scammers then ask consumers to install their remote control software onto the computer – for this there is a charge. At this point the scammers appear to run a few commands before announcing the system is very infected, even that it may crash within 5 minutes unlkess their software is purchased.